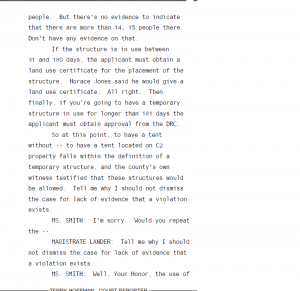 The rest of the transcript shows Mike Kimberl\xe2\x80\x99s testimony and the county struggling to prove that tents are unpermitted structures and that Sean\xe2\x80\x99s Outpost is in violation of Land Development code for having people camping there for unspecified amounts of time. 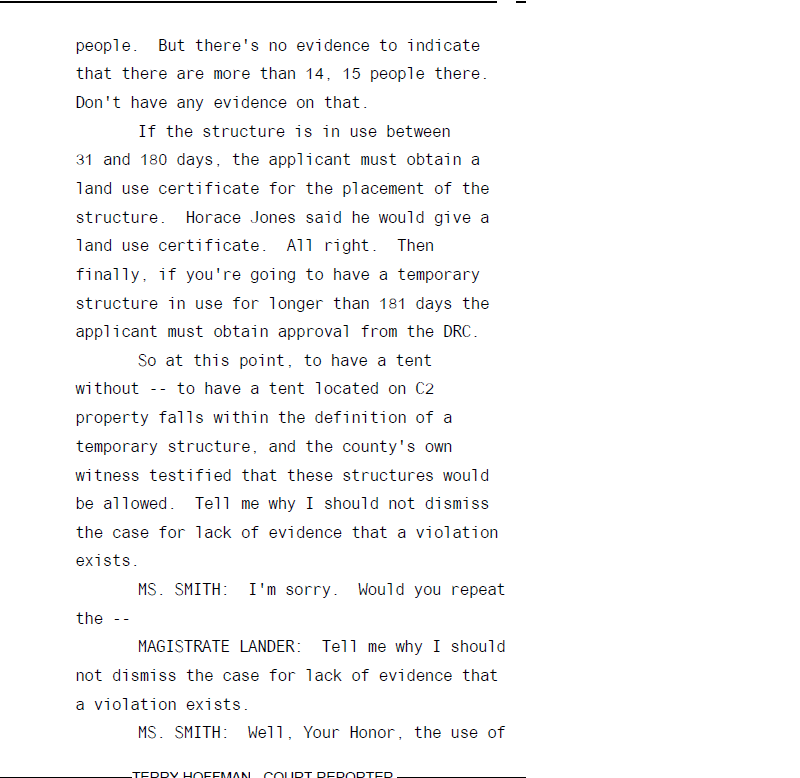 The county was grasping at straws trying to shut down Satoshi Forest, but not even the magistrate was buying it.Fast forward to yesterday, April 22nd 2014: Special Magistrate Lander dismissed the county\xe2\x80\x99s case against Sean\xe2\x80\x99s Outpost. This is great news for the team, and we hope to continue to make progress on the property. Support is growing locally and Sean\xe2\x80\x99s Outpost is much loved by the Bitcoin community.The struggle to help those in need continues, and this is not the end of the county\xe2\x80\x99s harassment of Sean\xe2\x80\x99s Outpost. While we had hoped that the ruling would alleviate some of the pressure on Sean\xe2\x80\x99s Outpost, Escambia County filed a suit seeking a cease and desist order to remove all tents from the property until regulatory approval. This would mean throwing the twelve campers at Satoshi Forest out on the street where they could be arrested if caught sleeping on public property based on creative interpretations of current code.The suit not only targets the corporation of Sean\xe2\x80\x99s Outpost, but also the primary individuals involved in running operations; Jason King, Leslie King, and Mike Kimberl. In a copy of the Circuit Court Complaint and Summons Mike Kimberl provided me, the county alleges that Sean\xe2\x80\x99s Outpost is in violation of codes regulating campgrounds, and cites the same violations that the Special Magistrate ruled were not violations.It will be interesting to see whether the Magistrate\xe2\x80\x99s ruling has any bearing on this other case. As Sean\xe2\x80\x99s Outpost attorney Alistair McKenzie mentioned in the Pensacola News Journal article, \xe2\x80\x9cIt just kind of seems like the county\xe2\x80\x99s trying to get two bites at the same apple.\xe2\x80\x9dThis is typical behavior from the county as it seeks to not only attack an organization, but singles out individuals to harm financially. I will have more details on this situation as it develops.If you are in the Pensacola area, you can show your support by coming out to the hearings or volunteering. If you are a fellow Bitcoiner in a far-away land, considering coming to Bitcoin in the Beltway where you can hear me and others speak on a wide variety of topics and from which 10% of proceeds will go to benefit Sean\xe2\x80\x99s Outpost.